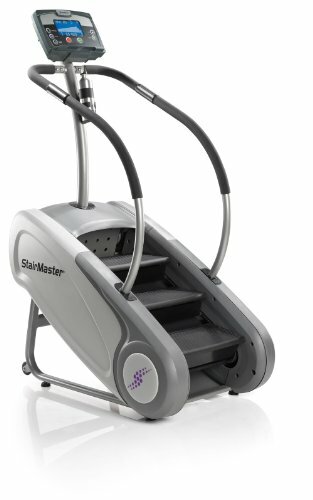 For nearly 30 years, the StairMaster StepMill has been called the toughest workout in the gym. Now you can bring that same toughness home with the new StepMill 3. With a revolving set of 6-inch stairs, the resulting step range of 26 to 162 steps per minute will strengthen your legs and boost your cardio. The SM3 offers plenty of workout options, with such programs as Quick Start, Manual, Steady, Mystery Challenge, Build, Bell Shaped, Calorie Burner, Fat Burner, Heart Rate Zone Trainer and Heart Rate Intervals. The console tracks your time, watts, calories, heart rate, level (1-20), floors/minute, segment time, floors climbed and workout profile. Additional features include heart rate pulse grips mounted to ergonomically designed handrails, automatic safety stop sensor at the rear of the base of the steps, a 275-pound weight capacity and an impressive warranty of lifetime frame, 5 year mechanical, 2 year electronics and 1 year labor and wear items.